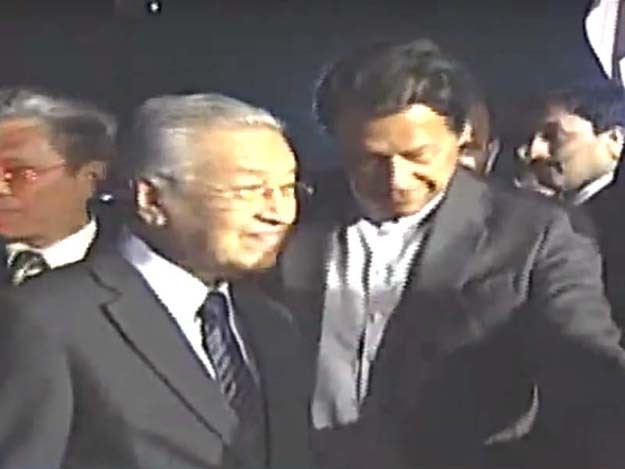 Malaysian Prime Minister Dr Mahathir Mohamad arrived in Islamabad on Thursday for a three-day official visit to Pakistan. The Malaysia premier is visiting the Islamic Republic on the invitation of Prime Minister Imran Khan, and will be the chief guest at the Pakistan Day parade on March 23. Mahathir, who was accompanied by a high-level delegation, was received at the Nur Khan airbase by the prime minister, Foreign Minister Shah Mahmood Qureshi and Minister for Planning, Development and Reforms Khusro Bakhtiar. He was given a 21-gun salute upon his arrival. In a statement, Foreign Office Spokesperson Dr Muhammad Faisal said Mahathir’s visit would further improve the brotherly and friendly relations between the two countries. He said the focus of the visit is on enhancing economic, trade, investment and defence ties for the mutual benefit of the peoples of the two countries. According to Reuters, Pakistan is set to sign deals worth $900 million in telecoms, information technology during the three day visit. Razak Dawood, the prime minister’s adviser on commerce said a memoranda of understanding covering $800-$900 million worth of investments with Malaysian investors would be signed on Friday.